The Pacific Northwest's weather made national news this past week by breaking the all time heat records since they began keeping records. We could almost predict the first question every caller was going to ask: "Do you have air-conditioning?" It happens that we do and as most tourists discovered—small inns with air-conditioning are as rare here as temperatures above 80-degrees. With breezes every evening off the Straits of Juan de Fuca and cool winds snaking down the valleys of those 6000-foot high peaks in our backyard, air conditioning is something we have rarely needed. Even when the thermometer hits the high 80s, there’s no humidity so it never feels that hot. Children here grow up without any concept of “muggy.” At night, we just open the windows and listen to the sounds of the creek that borders our property. 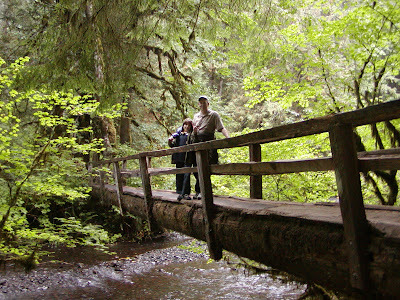 In fact, there are many wonderful walks in the Olympic National Park that are just perfect for cooling off on a hot summer day. 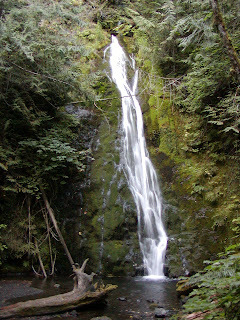 One of our favorite walks is Marymere Falls on Lake Crescent—an easy 2-mile loop. Many people never take the turn off and just keep speeding by on Highway 101 on their rush to Forks and the Pacific Beaches. They are missing a true hidden gem. The road along Lake Crescent was not created until the 1920s. Prior to construction of the narrow 2-lane road that hugs the shoreline of the lake, people took ferries from Seattle to Port Angeles and then traveled by wagon (later by car) to East Beach on Lake Crescent. There they boarded the side-wheel steamer Storm King for the journey to Fairholm on the West end of Lake Crescent. In fact, the Storm King ran tourist excursions on the lake until the late 1960s. It was this relative isolation that saved several amazing groves of old-growth Douglas fir trees from the rampant logging that had been going on since the 1860s elsewhere on the Olympic Peninsula. 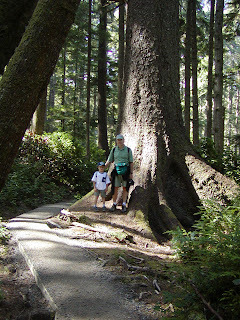 When the Olympic National Park was created in 1938, the trees became treasured heirlooms that anyone can visit and enjoy. The first thing you notice is how dark the forest is—even on a bright summer’s day. The stands of Douglas fir are like rows of tall colonnades stretching skyward. The high canopy of the trees blocks so much light that there is very little understory growth. Here the trail is carpeted in pine needles. This is a woodland trail—one of five (5) very different ecosystems in the Olympic National Park (a World Heritage site). The woodland forest differs from the rain forest—trees here are taller and closer together. The vegetation is less varied—mostly lichens and mosses and fiddlehead ferns. The rain forest has more Western Red Cedar which is susceptible to “blow down” which opens up pockets of light in the forest. You’ll find more salal, salmon berry and other understory species in the rain forest trails at Sol Duc, the Hoh, and Quinault. But here in the hush of the Marymere Falls trail one marvels at what the entire Olympic Peninsula must have looked like to the first European explorers (first the Spanish and later the British). The trail meanders across several log bridges before it reaches the base of the falls—a graceful 90-ft. ribbon of water that tumbles into a dark, mysterious pool. From the bottom, there’s a zig-zag stairway across tree roots to the top of the falls (this is the only real steep or challenging part of the trail and you might want to take toddlers and young children by the hand so they don’t venture off). We especially love this trail in late fall or early spring when there is more water and fewer hikers (it's open all year). There's a lovely little rough hewn bench midway up the final climb where we love to sit a while. Be sure to stop here and take in the sighing of the wind, the creaking of the tree branches, the dripping of miniature water cascades over mossy rocks—the smell of the forest. On the way back to the trailhead, you’ll pass a marker that explains tree rings on giants that were growing here when Michelangelo was painting the Sistine Chapel. As you look up, there is a sense of standing in an outdoor cathedral—with an architecture more stunning than any constructed by man.